The “My Favorite Things” quilt is another Irish Chain pattern from Craftsy. This quilt is another part of the 5th Amy Gibson quilt class. This finished size of this quilt is 84 1/2″ X 84 1/2″. Materials needed: sewing machine, batting, thread, rotary cutter, cutting mat, rulers, marking tools, pins, seam ripper, walking foot (optional), iron and chosen fabric. I made the majority of this quilt using scraps from my first twisted chain quilt. I just had to buy some more white and tan fabric for the front as well as additional background fabric. All the color pieces were from my original fat quarters. 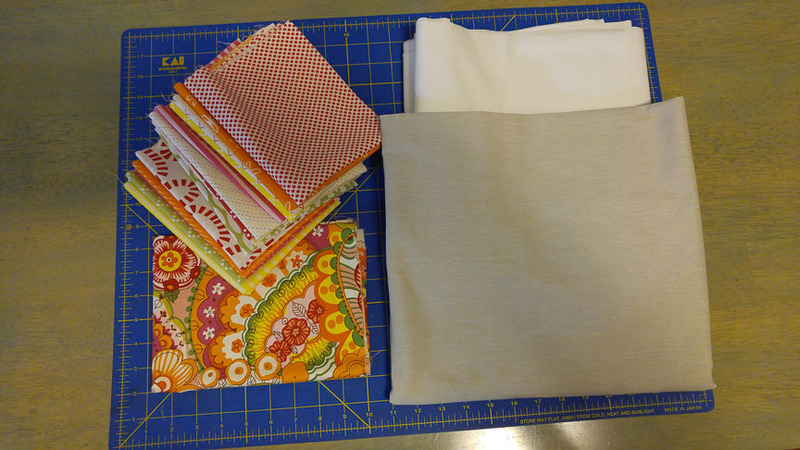 I am happy to say I still have about 1/2 of my fat quarters left for another project. This quilt was used by making strips and cutting them down to form my square rows. The rows where then attached to form larger square blocks to place in between each of my color squares. Making each of my color squares. One of my favorite parts of quilting is laying it out to decide on the final design. Sewing each block section together to form my rows. The front of my quilt completed. The size of this quilt was so large that I had to sew two different sections of fabric together to form the back. I always try to get my line right down the middle. You can’t really see the line anymore once I have finished with all my quilt lines. I made my quilt sandwich and placed all my pins. Working on my binding. I usually make my binding from scratch. I don’t like being limited by store choices. I am really loving this fabric for binding. It is very soft and has a kind of heather look to it rather than a plain old solid color. My quilt is all squared off and ready for me to attach the binding. Close up of the back.